Happy Holidays! and Merry Christmas too! Also Happy New Year! Pat and I spent Christmas with his 95-year-old mother in Florida. To give you an idea how Marie is doing, she received an iPad for Christmas so that she can see pictures of the kids on e-mail and Facebook. I teased her about on-line dating, and she said she understood it was better to meet someone new in a public setting. It was a very different experience than Christmas at the ranch. Instead of snow, we had sandy beaches, and the swimming pool at Marie’s senior housing complex. If strangers (us) show up at the pool, they are grilled until the questioner is satisfied that the new swimmers are truly guests of a resident, and not a pool crasher. 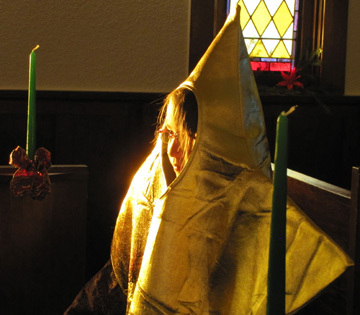 We found a small church on nearby Jupiter Island where we attended Christmas services, and also found contrasts. Instead of sharing on-street parking with the local bar, we parked on the adjacent golf course green. In Wyoming, we change out of our barn snow boots into our go-to-town snow boots and that is considered dressing up. Of course, folks in Wyoming wear the brand new Carhartt coat that they just received for Christmas to dress in the height of fashion. In Florida, all the guys were in sport coats and all the ladies were in dresses. Luckily, I had taken one for just such an occasion. 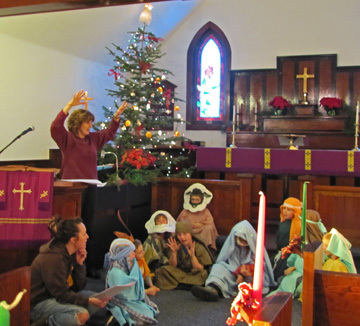 We were pleased to hear the sermon focused on shepherds, particularly the shepherds of the Nativity. The pastor said that it was significant that the angels appeared to the shepherds, because they were considered to be of very lowly status. He noted that the work of the shepherds was essential to the religious life of the time, since an estimated 350,000 lambs and sheep were slaughtered each year as part of religious ceremonies. I wonder why, then as now, the work of shepherds is considered to be lowly, when it is honest and important.To tell you the truth, when we go to the Cowboy Poetry Gathering in late January, I may slap someone if I hear one more “At least I ain’t herdin’ sheep” poem…but I digress. 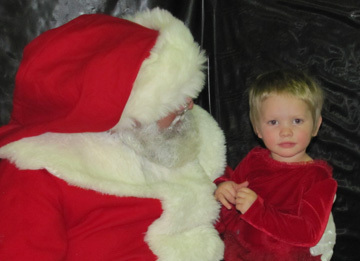 With that in mind, here are pictures of my really cute grandchildren making our Christmas season a lot more fun. 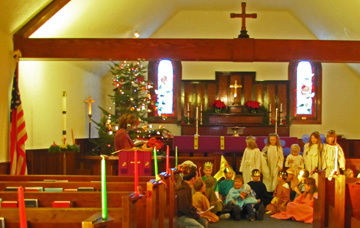 Most of the cast of the Nativity Play at St. Paul’s Episcopal Church in Dixon, Wyoming. 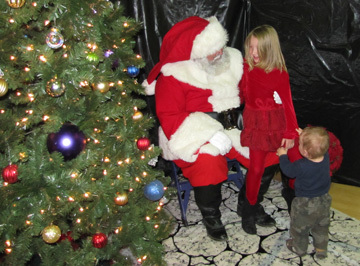 The kids come from several denominations to participate. It is followed by pizza and birthday cake, complete with singing “Happy Birthday” to Baby Jesus. 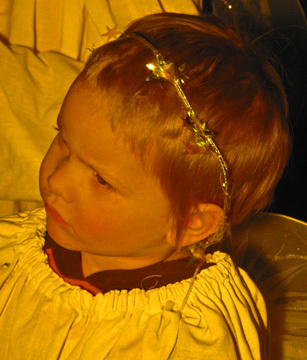 Siobhan is the Chief Angel, Maeve is the littlest angel, and Seamus, of course, is a shepherd. 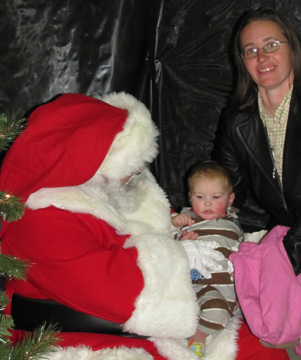 Santa, Siobhan and McCoy. 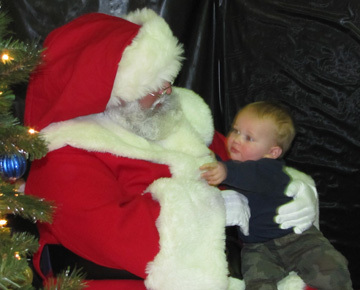 McCoy was NOT afraid of Santa. 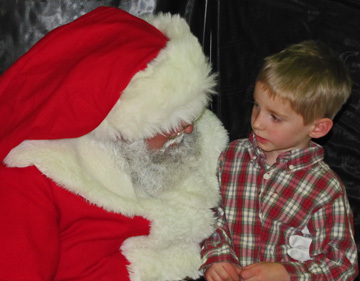 Seamus in earnest conversation with Santa. I think he is explaining about Maeve's new haircut! Yes, McCoy, the beard is real! Judging from the gifts the children received, Santa must have judged them good. I thought it was touch and go for Seamus and Maeve, however. Note Maeve’s really really short haircut.